Manage the pay cycle from beginning to end. MYOB Exo Payroll is a powerful and simple payroll solution for medium sized and larger businesses. It will process pay, track holiday leave and maintain your employee records – as well as keeping up with tax and legislation changes. It's an all-in-one management tool that lets you track labour costs, analyse trends and create detailed management reports. As the core module in the Employer Services suite, Exo Payroll is in use across a wide range of industries. Exo Payroll can allocate relevant taxes, accrue leave and other entitlements, and calculate allowances automatically. All this information is presented to users by way of a comprehensive report library, including audit reports. Exo Payroll guides the operator through the entire process with its unique stepped approach. It allows unlimited processing for allowances and deductions. It does multi-level cost centre analysis, unlimited costings and hourly wage rates per employee, one-off commission payments, terminations and ad-hoc pays that don't always fit with standard periods. It manages superannuation to the correct general ledger and super codes with full audit reporting. Exo Payroll integrates with all banking systems. It can do GL exports to most accounting systems, including one-click integrated to MYOB Exo Business. It's an easy system to switch to, with a year-to-date loading wizard to easily load your pay history from old systems. Automatically accrues leave and handles payments in accordance with legislation. 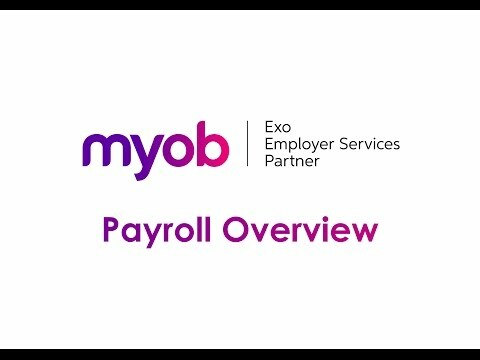 Visit the MYOB Exo Employer Services YouTube channel for a full MYOB Exo Payroll video playlist of video demonstrations and tutorials.